Elizabeth likes... | I like quite a lot, actually. It's all about finding joy in the little things. I like quite a lot, actually. It's all about finding joy in the little things. 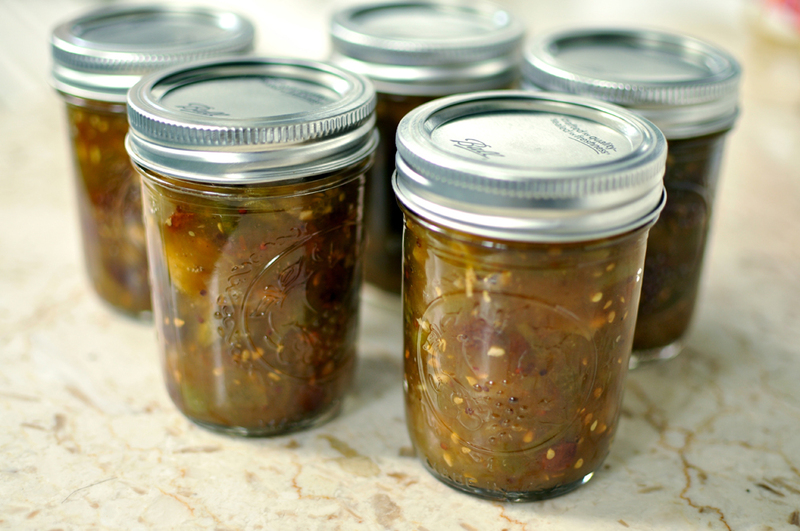 Pinned recipe: green tomato and apple chutney. The end of the tomato season. The onset of cold weather brought the end of the tomatoes. Some had a blush of color—they’ll finish ripening off-vine—but most were decidedly hard and green. I was bummed. And I hated the idea of throwing them out. The only thing I knew to do with green tomatoes came from watching a movie, and breading and frying has never been my thing, so I went online to find a way to make use of the final harvest. 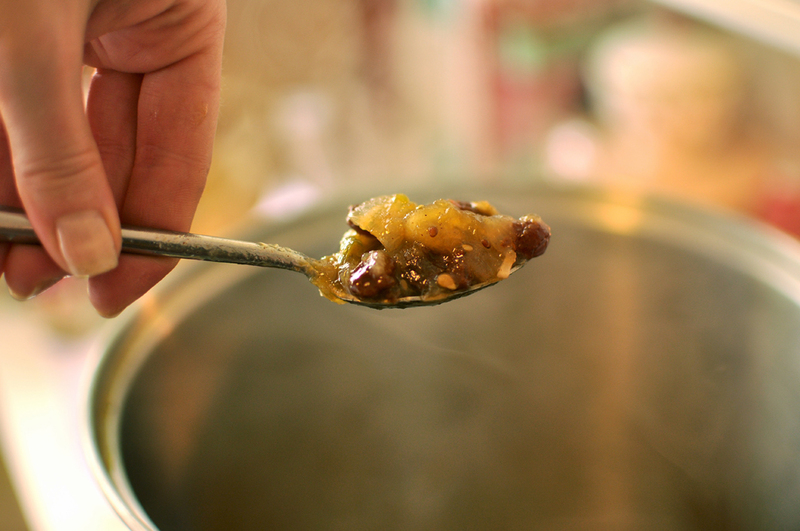 Bingo: I found a recipe for green tomato and apple chutney on The Slow Cook and immediately pinned it. It was described as “powerfully good stuff,” how could I resist? As recipes go, it’s pretty easy. Chop a few things, cook in a pot, add some flavorings, cook it some more, process in jars. 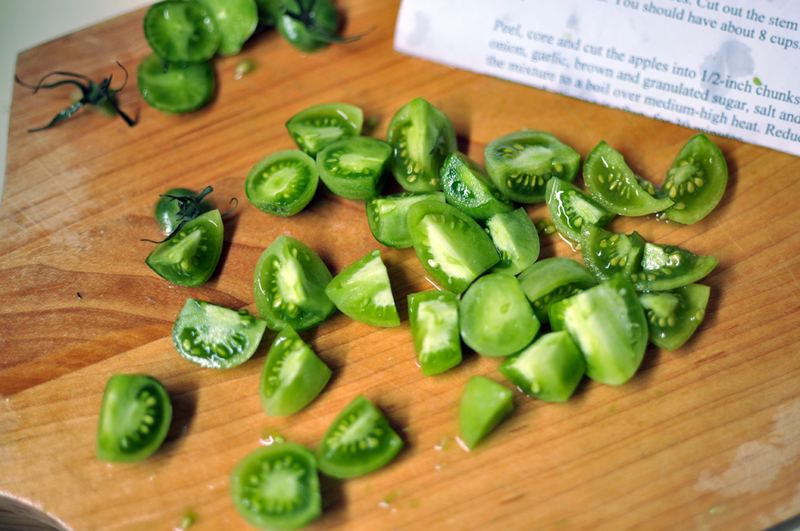 And chopping green tomatoes is a breeze, they’re firm and don’t fall apart into wet mush. My favorites were the unripe black cherry tomatoes… they had beautiful emerald green insides, and only needed to be halved or quartered to get to the right size. Unripe black cherry tomatoes taste like tiny tart apples with liquid centers. Is it mounded? I say yes. And, that’s it. Process, and… PING!… you’re done. I halved the recipe and filled one pint jar (for eating now) and five half-pints (for storing/gifts). 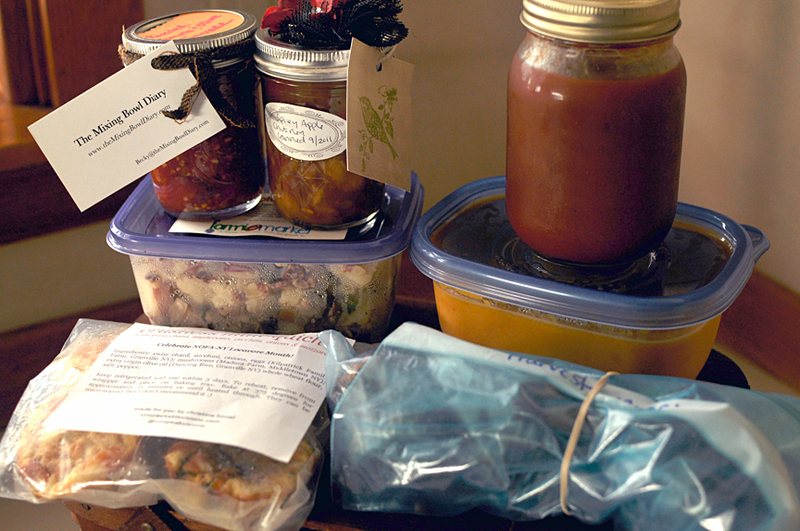 The chutney is supposed to get better over the next few weeks as the flavors incorporate, but what I sampled before canning was already pretty tasty. How perfect that the end of tomato season overlaps the beginning of apple season here in the Capital District. 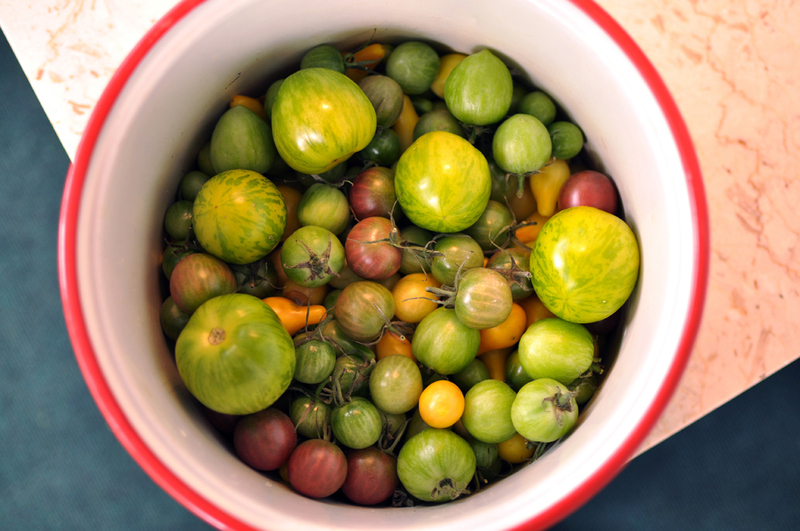 Don’t be sad when the end of summer leaves you with green tomatoes… make green tomato and apple chutney! I consider myself to have a fairly healthful diet. I’m not overly fussy about every thing I eat, but most of the time I’m actively trying to make good food choices. And I enjoy eating things that are horrible for me in the remainder. And I’m ok with that. Still, for some reason Eating Rules’s October Unprocessed challenge caught my eye, and I decided to make the pledge to eat only “unprocessed” food for the month of October. The term “unprocessed” is pretty tricky to definitively pin down. Andrew Wilder—the man behind the challenge—says, “Obviously there’s a wide range of implications in that word, and we will probably each define it slightly differently for ourselves.” He personally defines unprocessed with something he calls “The Kitchen Test.” Specifically: “Unprocessed food is any food that could be made by a person with reasonable skill in a home kitchen with readily available, whole-food ingredients.” Well, I’m down with that. So, here we go. I think this will be a rewarding exercise in mindful eating. I’ve had no problems so far, aside from the very first morning when I was puttering around the kitchen with my morning coffee and sleepily bit into a leftover ginger snap then suddenly remembered the date, checked the label and spit it out. Because those “traditional” cookies also included a few ingredients like refined sugar, palm oil with TBHQ, and soy lecithin. 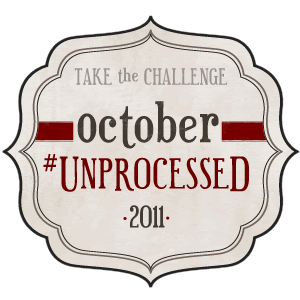 If you want to learn more about October Unprocessed, or take the challenge yourself, click the logo at the top of this post. Looking back on the last couple of months of posts you’d think that the only things I like are food-related! I’ll be honest, I do like food a lot. And ever since we moved into our house I’ve been heavily focused on gardening and cooking. But there are plenty of non-food things in this area that make me happy. 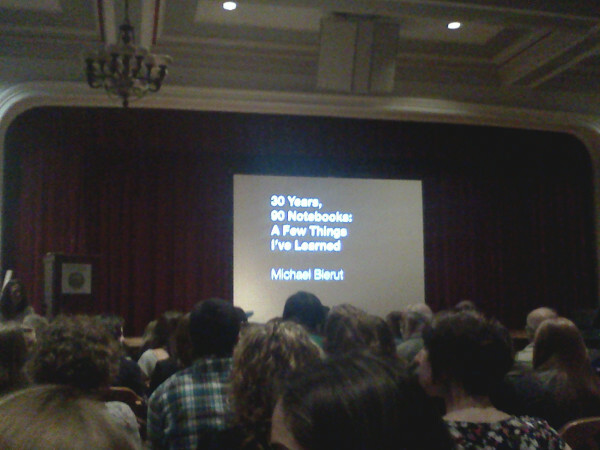 For example: graphic designer Michael Bierut’s show 30 Years 90 Notebooks at the Esther Massry Gallery at the College of St. Rose. I went with two fellow designers to the show’s reception this past Friday, and afterwards enjoyed a short presentation about the show and some Q&A with Bierut. As I said to someone later that night, work by Bierut and his colleagues popped up so memorably throughout my various years of graphic design study and post-art school experience that listening to his stories felt like hearing tales of old friends. I caught myself smiling and nodding along on multiple occasions. 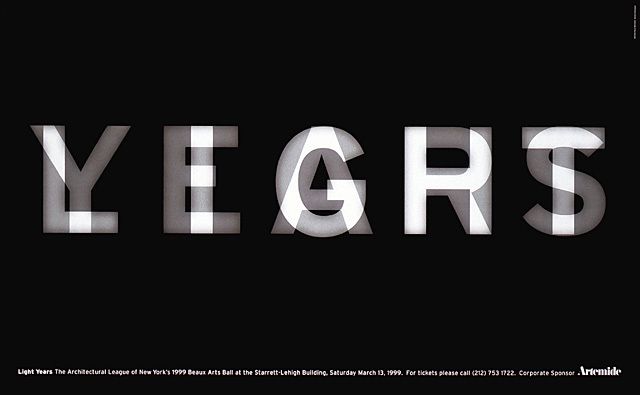 The show itself is a collection of work from 1987-2010. The designs are usually clever and always concise, my favorite kind of thoughtful solutions that rely on smart typography and page layout, not a particular color palette or the latest photoshop filter. You’ll also see the creative seeds of some of the pieces in the handful of notebooks on display, which intersperse mundane facts jotted down during client and colleague meetings with rough sketches of brainstormed ideas. Obviously if you’re interested in classic graphic design it’s a good visit. But even if you’re not a big ol’ type & design fangirl like me it’s still an accessible show, and a nice look at communicating visually. Check it out! 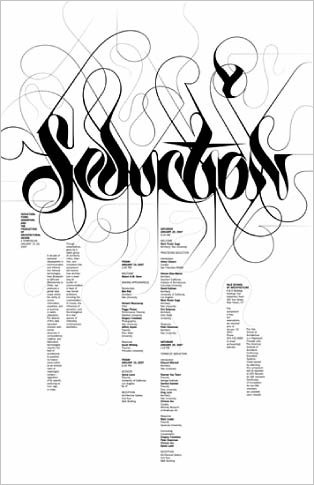 Yale School of Architecture Seduction poster by Michael Bierut with titling by Marian Bantjes. This is my grandfather, known to friends and family as Gramps, or ‘Red’. 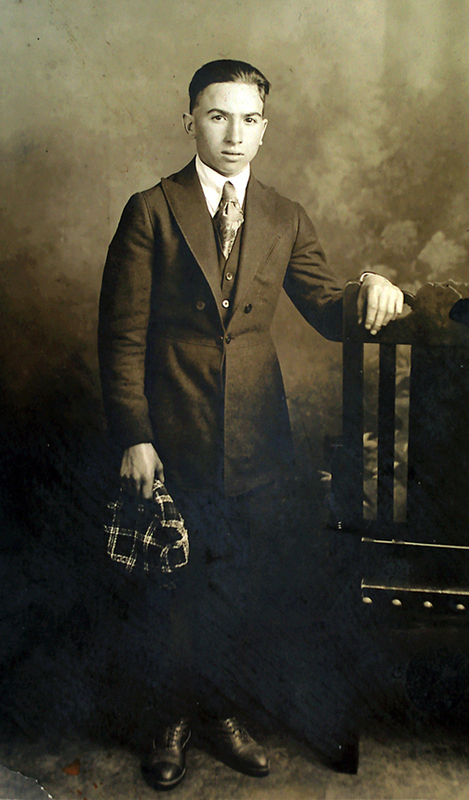 He was born in Italy in 1901. At age 8 he boarded a boat in Palermo and sailed to Ellis Island, on the way to his final destination of Albany, NY. In Albany he met my grandmother and they had 2 daughters (the youngest would one day become my mom.) He and my grandmother lived next door to his brother and sister-in-law. 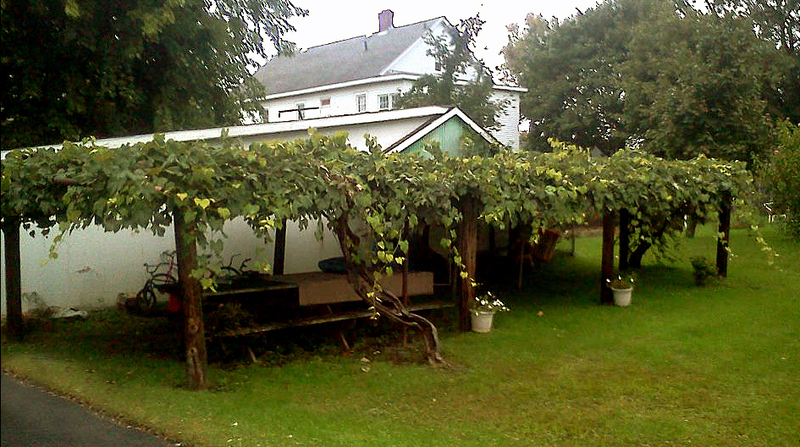 And in the yard between their two houses, Concord grapes were planted. The family mythology is that these grapes are from a parent plant that was smuggled traveled over on that boat from Italy. Except, Concord grapes are native to Northeast America. But allegedly the variety was introduced to Italy before Gramps emigrated, so I suppose it is possible. I’m certainly not going to be the one who calls shenanigans on a great story. Regardless of where the plants originated, the arbor inspired memories of home. And over the years family members used its bounty to make jelly, juice, and (probably questionable) wine. This year I decided to get in on the action. Concord grapes typically ripen near the end of September, so I stopped at the house (now owned by my Aunt) a couple of days ago. Unfortunately I arrived about a week too late. The smell of fermentation was heavy in the air and it was pretty slick and squishy as I walked along, searching in vain for decent bunches. I gamely filled up my spaghetti pot anyway, determined to make at least one jar of jam. When I got home I patiently washed and sorted the overripe bunches, picking off any good grapes, salvaging as much as I could. I ended up with a bit over 2 lbs of usable fruit. So, what did I make? 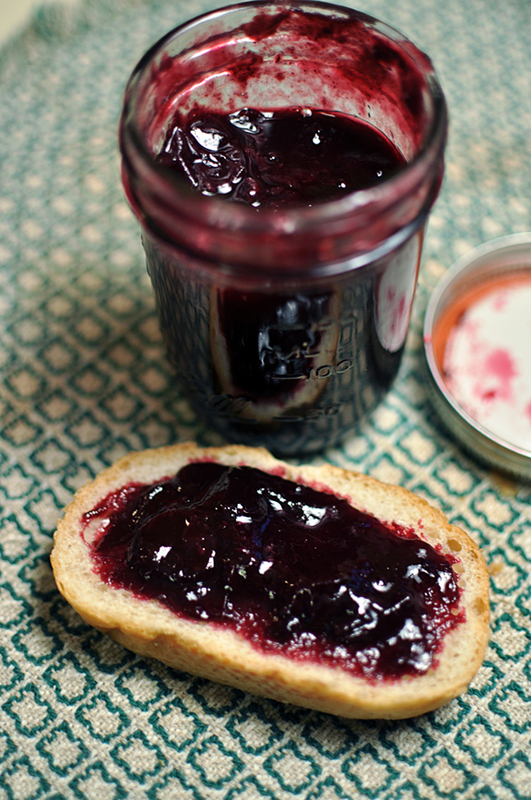 A recipe from the 1953 book Old Time Pickling and Spicing Recipes for Spiced Concord Grape Butter. The ever-encouraging Stephen came over to help me through my first time making something that needed to set/gel. Our friend Alex also joined in to lend an arm (stir! stir!) and learn more about canning. From my tiny harvest we managed to fill 5 jelly jars and a wee sidecar. Oooooh, it was tasty. Deep purple grapey goodness, with a hint of tang and spice to add depth. We tried it plain. Then we tried it on bread with peanut butter. Stephen talked about filling cakes and Alex suggested it would be good as a cheesecake topping. Funky cheese was mentioned, so we pulled out crackers and the Dorset from the Cheese Tour and spread the last leftover drops over that. The only thing I’d change would be to pick the dang grapes on time so I could have 5 times as much haul. Lesson learned: next year I’ll start checking earlier. Gramps passed away long ago, but I’m grateful we still have this family legacy. His birthday would have been one week from today. I’ll enjoy some delicious grape butter in his memory. This past weekend I harvested the remaining tomatoes and cleared out my containers, which was a bit sad. 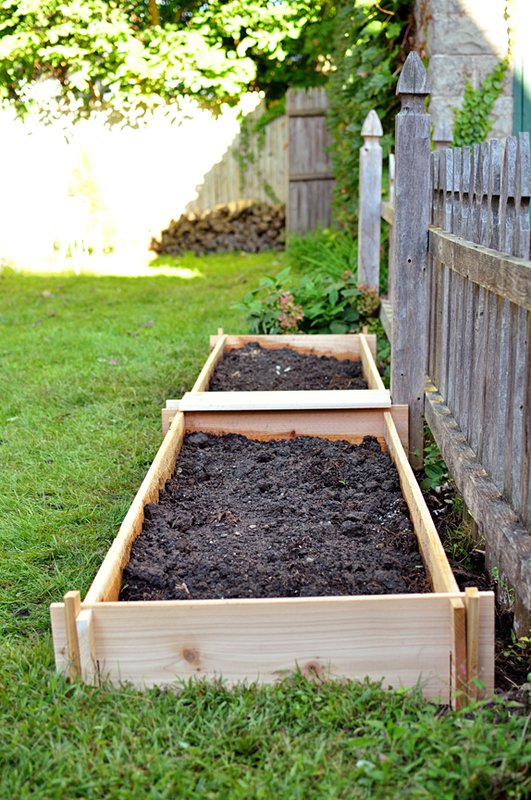 When I left for Sunday’s swap there were saw noises coming from the garage, and I came home to two cedar plank raised beds built by a certain handy (and handsome) man replacing the stretch previously occupied by containers! Time to start composting again and dream up next year’s garden. I’m thinking less tomatoes, no peppers, same amount beans and way more greens. What do you plant in your backyard? My first FSC Albany swap. Yesterday was my first time participating in the From Scratch Club Albany Swap, held at All Good Bakers. I brought 6 pints of whiskey’d pears (pears from Samascott Orchards in Kinderhook, NY) and came home with a basket full of things I’m excited to eat. I’m so happy I went. Everyone was very welcoming and friendly, and even though I couldn’t take everything home with me it was great inspiration to see the variety of things people whipped up. Like: now I have an idea for another use for my rampant backyard mint… hello, mojito body scrub! Arrive promptly. It takes time to say hello, sign in, set up your swap items and check out what other people brought. You don’t want to be rushed. I arrived 5 minutes early and lingered in my car until a few minutes after 4 to make sure I didn’t show up too soon, but there were plenty of people already there and setting up by the time I got inside. Bring extra for samples. The best way to promote what you’re offering is by letting people try for themselves. I brought an extra bowl of pears cut in bite-sized pieces with toothpicks for easy tasting. Mingle after you set up! Put a face with the food! I regret letting my shyness take control and not being bolder about mingling. If you’re not sure how to start a conversation, ask people what they made. It’s a great opportunity to meet new people with similar interests. And, when swap time comes, you’ll know who you need to speak with to nab that awesome _______ you spotted. Take notes. Especially if, like me, you don’t know the majority of the people in the swap. Write down what you’re interested in and the name of the person who made it. Write down the number of the table, too, so when it’s time you can make a beeline to your most-wanted trade. Dont limit yourself to six offers. You have six items to swap, but not every offer to trade you make is going to be accepted. It’s not personal, maybe they just don’t like spicy foods or have a food allergy or already have a freezer full of whatever it is you brought. So, offer away on anything you’d be willing to bring home with you. Be quick during the swap portion! I’m a bit on the timid side when it comes to bartering and hung back a bit. FSC’s Christina urged me to jump in, warning people run out of things quickly… and it’s true! Though I had 7 people interested enough to sign my swap card, by the time I tracked them down many had already swapped away what they were offering. Before swapping starts, scan your card and see what people are offering you. If there’s something on there that was high on your wish list, grab one of your offerings, find where that person is, and get ready to gently hustle over and offer your trade as soon as swapping starts. There’s always post-swap swapping. After it was over some friends and I were reviewing our trades, and one bemoaned not getting a certain item. It turns out I had said item, and in exchange he offered something I had sadly missed out on. Everyone wins! 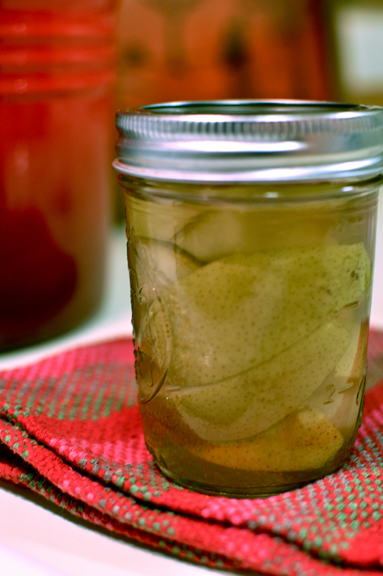 Pinned recipe: Pear slices preserved in a light syrup… and whiskey. The original post I bookmarked from Well Preserved. Followed the instructions, but added a couple cloves, a wee dash of vanilla, and 1/2 Tbsp Bärenjäger honey liqueur. I also added an ‘e’ to ‘whiskey’ in the recipe title because that’s what is on the Jameson’s bottle; don’t mistake me for an expert in whisk(e)y semantics. Whiskey'd pears! In a jar! Edit: So, the original recipe as made provides a very simple sweet pear flavor. My first batch additions (honey, vanilla, a couple cloves cooked in the syrup) added a little depth but still ended up staying pretty close to sweet pear. I made another 6 pints for a local swap following the original recipe, but adding 1T of the honey liqueur, 2-3 cloves and 1 star anise per pint to attempt to really spice it up. Hoping it’s not overkill. We’ll see when I crack one of the extras open this winter! 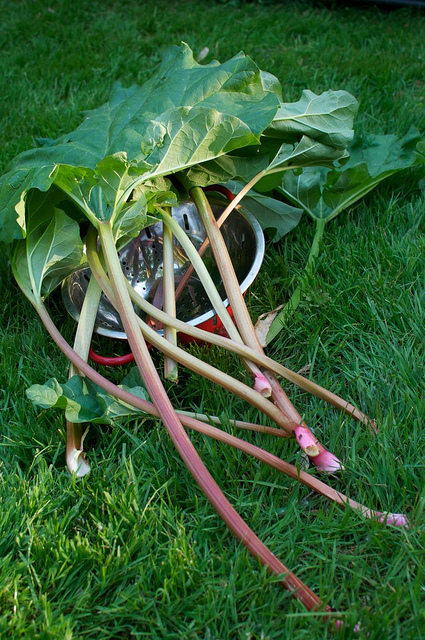 Things to do with rhubarb: take one. Remember the surprise rhubarb? Here’s what I did with the first bunch I picked. Soon after discovering my tart friend I twisted off some of the outer stalks for experimentation. I guess I need a bigger container. 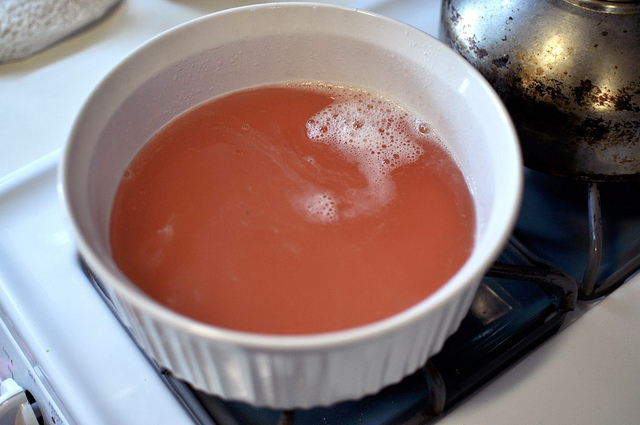 Our kitchen wasn’t even completely unpacked at this point, so I kept my first foray very simple: rhubarb syrup. Step one: Chop ‘em up and put them on to boil with water and sugar for about 15 minutes. If I recall correctly I used equal parts water and sugar, but I don’t remember how much in total, and I didn’t measure how much rhubarb I had. I guess it turned out to be a very unscientific experiment, my high school chemistry teacher would not be impressed by my (lack of) quantitative rigor. 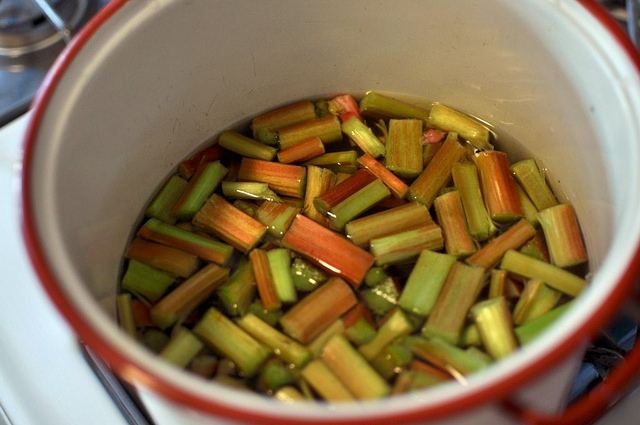 Rhubarb boiling in (approximately) equal parts sugar and water. Step two: Cool slightly and strain. I used a strainer basket lined with cheesecloth and then squeezed out every last bit of liquid. The squeezing part is why you need to let your syrup cool. If you’re not planning on manhandling a heated sack of vegetable pulp, you can strain right away. Step three: Pour into clean containers. Cooling off on the window sill. This should be kept refrigerated. I’m not sure how long it will keep; I finished using it quickly. 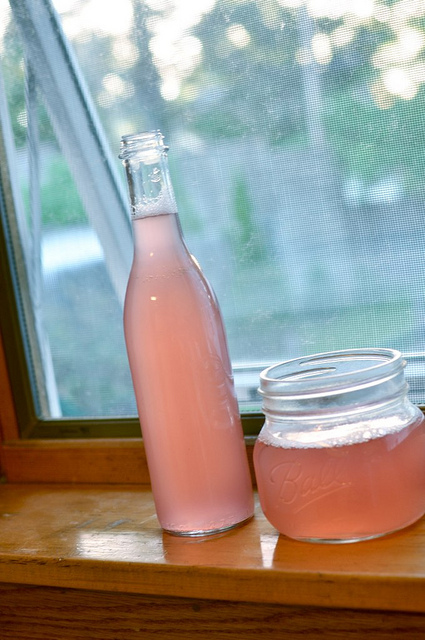 I used rhubarb syrup to top off ginger ale and plain seltzer for refreshers. I mixed it into various vodka, gin and rum concoctions. I even added some to prosecco for a rosy toast. There may be food applications for rhubarb syrup, but I never got that far… drinkin’ use only. I am getting too old to be up late drinking whiskey and listening to loud music, but I still had a great time at Friday’s 518 Rock n Relief Fundraiser at Valentine’s, sticking it out to the (near) end. It was nice to see a number of our musical acquaintances rocking out for a good cause. And kudos to organizer Eric Halder of Charmboy, because even with 18 bands, multi-item rolling raffle and bake sale, it was the smoothest-run event I’ve been to at that venue. The Washington County Cheese Tour was a nicely pastoral late-summer road trip. 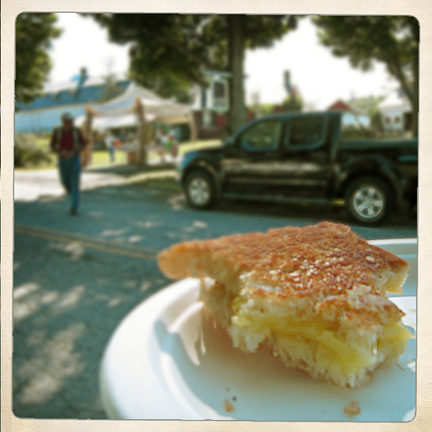 Like last year’s tour we added stops at Hick’s Orchard and Roy Egg Shop. And even though I was stuffed with freshly-made cider donuts, I did not pass up the cheese panini offered at Consider Bardwell. It’s made with their Pawlet cheese, and is seriously tasty with a bit of mustard on the side to cut the richness. My 2010 Pawlet panino from Consider Bardwell Farm. Didn't even stop to take a picture this year, just scarfed it down. Saturday’s Meat Fest was my first foray into making a large quantity of mashed potatoes that would be held for a while. I found a few tips and tricks online, and they all worked smashingly! Pun not intended! I might devote a post to making mashed potatoes, with fall and (gulp) Thanksgiving on the far horizon. If, like me, you enjoy sharing popcorn with a movie buddy, don’t do it while watching Contagion, unless you want to become increasingly disconcerted for 105 minutes. A “green” alternative for seasoning wood. 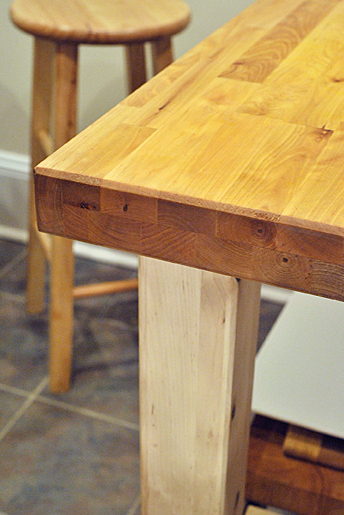 I’m adamant about keeping the wood in my kitchen cared for, and I’ve long relied on mineral oil to season and protect. Thursday’s post about “herbal oil” on Re-Nest was the first time I’d considered the possibility of greener alternatives. The product mentioned, BioShield Herbal Oil #2, comes in at a much higher unit price for household sizes: $7.50 for 3.4 oz (!) or $17.50 for 25.4 oz, compared to $5.29 for 16 oz of CVS branded mineral oil. Is this just capitalizing on the “green” movement? Or is this fancy version of linseed oil significantly better for the environment and/or oneself? I’d be willing to sacrifice some performance and some pennies if there’s a major difference. My amateur sleuthing (i.e. scanning wikipedia) isn’t helping to clarify much. Until I learn more I doubt I’ll throw out the bottle of mineral oil I’m using now, but maybe when the container’s empty I’ll experiment with something new.